Stop press our Weekday Womens Rides are back for 2018! Do you struggle to get out in the evenings on your bike because of child or work commitments? Join us on a Wednesday morning for our weekday women’s rides and ride with like minded local ladies. The rides have an entirely social focus, and will be anything from 15-20km of off road riding. 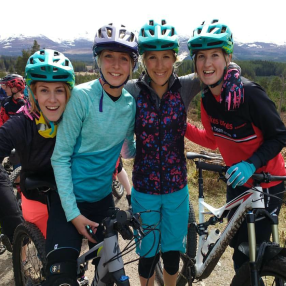 You must be a confident rider and able to ride all of the trails around the Rothiemurchus and Glenmore Forests, however do not hesitate to ask us if you are unsure what level you are at. We ride every Wednesday at 9.15am from Mikes Bikes in town. Message/Comment/email (info@aviemorebikes.co.uk) to book – places limited as usual. Come and try new routes! Enjoy coffee and cake when where possible. & have a great time!